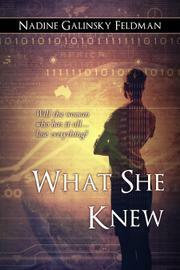 A Wall Street executive’s life changes drastically when her firm takes a huge hit during the Bernard J. Madoff scandal. Feldman (When a Grandchild Dies, 2014) tells the tale of Liz Nabor, a Wall Street executive who seems to have it all: perfect job, perfect boyfriend, perfect New York City lifestyle. It should come as no surprise that this situation does not last—the catalyst for the transformation in this novel is the real-life Madoff scandal, which results in a huge loss for Liz’s firm. One of Liz’s clients, the fictional Jim Leininger, was in league with Madoff, which causes the firm to fire her and her boyfriend and results in her friends shunning her, blaming her for their financial losses. Soon the innocent Liz realizes that she may be facing criminal charges, despite her ignorance of Leininger’s machinations. On top of all this, Liz receives word that her estranged Aunt Eddie is ailing in faraway Port Livingston, so she visits to try to make peace with her family while she still can. When Aunt Eddie bequeaths her own journals to Liz, the fired executive realizes that the key to solving her present problems and forging a new future may lie in the past. She must figure out whom to trust and who really has her best interests at heart. Feldman creates an engaging story here, and setting it during the 2008 financial crisis and the Madoff scandal links it to the zeitgeist. She peppers it with effective details that bring the story vividly to life without slowing it down. Liz’s arc, of loss followed by a search for redemption, is fairly predictable, as is some of the writing—Liz realizes that “somehow, along the way, she had lost any sense of true friendship,” which is hardly surprising. It also seems obvious that the hunky caretaker of Aunt Eddie’s house may become more than just a friendly supporter to Liz. Yet, this doesn’t detract from the story’s earnest appeal and likable characters that make readers feel invested (pun intended) in the outcome. A predictable but entertaining story about friendship and financial schemes.